Men always gave flowers to women as a sign ofattention, and in the day of the wedding - it is their sacred duty. Classic bridal bouquet - red, and the flowers - roses. These flowers accentuate any style and the bride will blend in perfectly with the white dress. However, red bridal bouquet girls love not only with roses: the perfect combination in a floral symphony peonies, lilies and poppies, tulips, peonies and calla lilies. 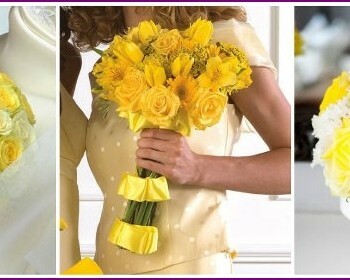 Which of flowers looks better in the hands of the bride - in a colorful performance or monovariante? Let's face it. 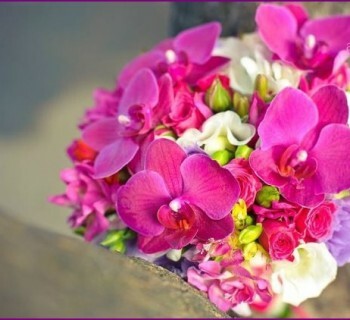 Also, in the preparation of floral weddingattribute is to pay attention to the meaning of the elements. For example, red roses symbolize lasting love union, and the round shape of the bouquet - reliability, infinity relationships. Gerbera in that color symbolize innocence, youth, fun, therefore perfectly suited to young brides. 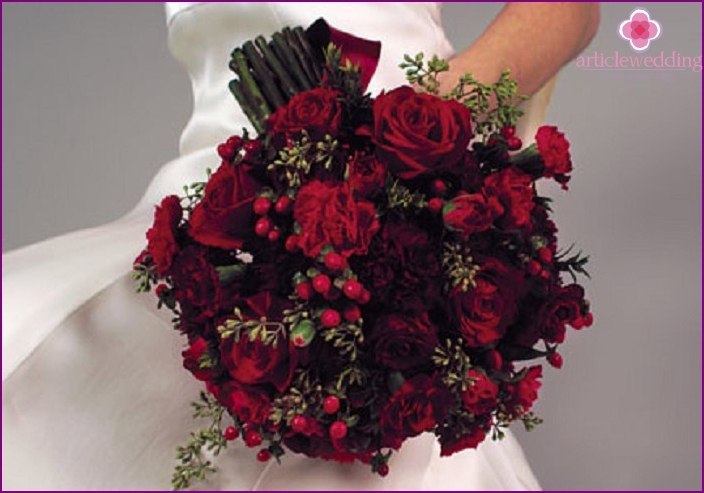 Often wedding bouquet the bride and groom choose depending on the season: winter red roses diluted with white flowers or a sprig of mountain ash, and the spring in the way of harmoniously fit spring red tulips with mimosa. Among the options for the summer I want to highlight the redbouquet of peonies. These familiar to us the bride's flowers have long been used at the wedding, so peonies big rivals traditional roses, orchids, Cullen. They are attracted to its fragrance, lush buds and delicate flower petals form a fringe, which is beautifully shimmers in the sun. This bouquet perfectly combined with a magnificent white dress of the bride. Tulips symbolize fidelity and perfectLove, therefore, ideal for wedding bouquet yourself. 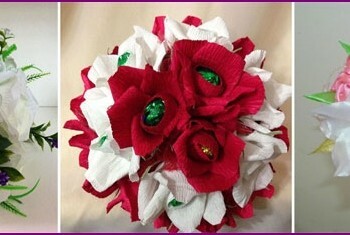 They can be arranged in a bouquet-stage, round bouquet or hand-knitted. Red tulips will not only create a festive mood, but also to make any image of the bride gentle, young and fresh for spring. Choosing bright tulips in a bouquet at the wedding, the bride symbolically shows his great love for the elect, because the secret language of flowers tulip - it's a passion, romance, great love. 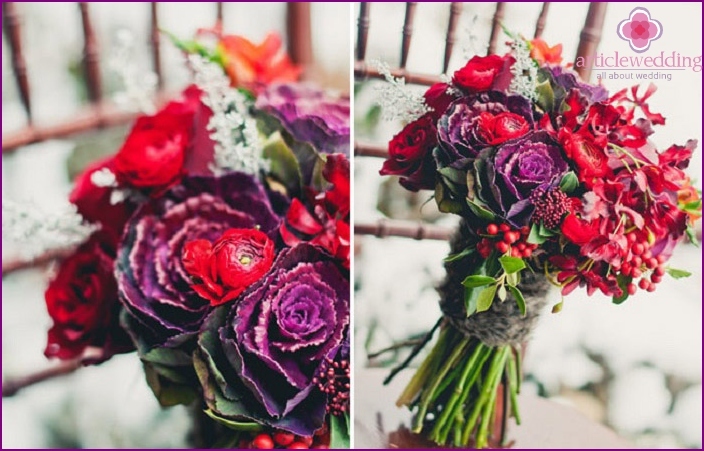 Red saturated colors are ideal forwinter wedding, because this color for all people associated with New Year's holidays. Red and white, red and green - a harmonious combination of all floral fantasies. Experts say that a combination of several colors looks much more interesting than a one-color composition in the hands of the bride. So, they offer a combination of red, pink, beige, white. Admitted to the wedding multicolor combinations -red with yellow or blue - but in any case, such a diluted mix of herbs - leaves, stems or grass, to ensure the smooth transition from one color to another. Elegant wedding composition will look where the red color, combined with pale pink, will gradually move into the white. Too obvious contrast shades florists usually administered in a bouquet decor in neutral tones. 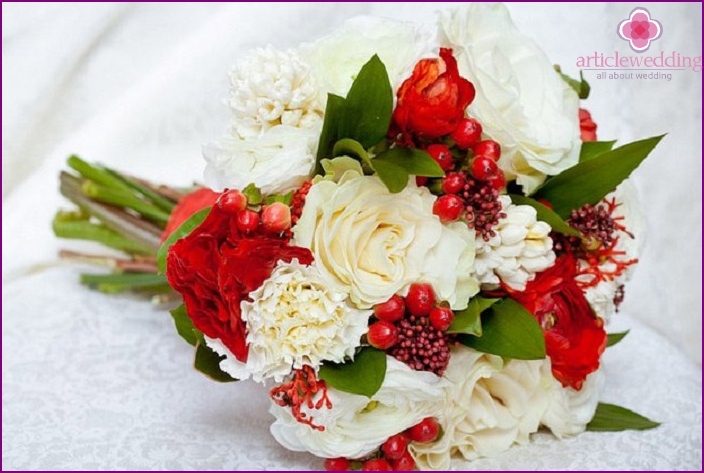 Wedding Bouquet of red and white flowersIt looks great. The temptation and purity, passion and affection, prosperity and infinity - that is, ensuring the newlyweds red with a white bridal bouquet. The unity of opposites, because the red - this tension, passion, and white - Upland, purity, serenity. Together they create a gentle and passionate love. If the bride has picked up the white dress, the red color is displayed in the shoes, lacquer, lipstick, accessories. If the red color of the dress, the accessories, and shoes must be white. 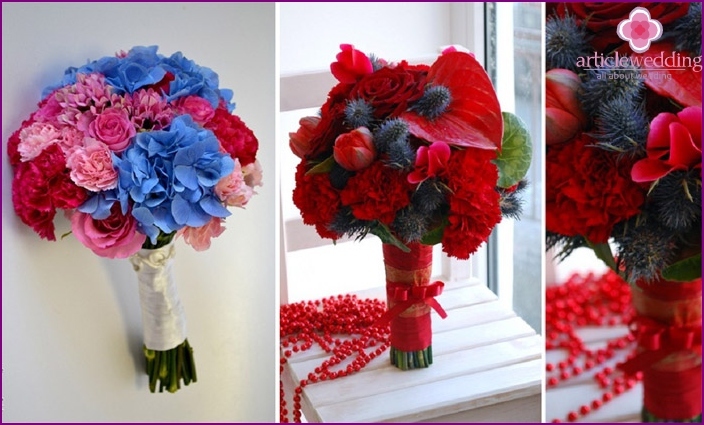 Red and blue flower in combination can imaginelet's wedding confident girl. This assembly will not go unnoticed, giving the image of a bride complete. Bouquet of red and blue colors obliges the bride with a focus approach to the selection of his attire, because not all shades are combined such flowers. Typically, red roses are elegantly blended with blue or blue irises, hyacinths, hydrangeas, delphiniums, cornflowers, violets. In addition, the composition is often used a small amount of baby's breath and white freesia. 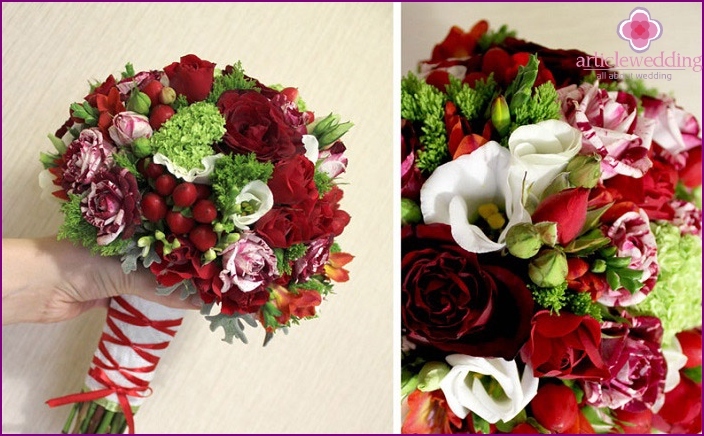 Red with green in a bouquet to choosethemed weddings that take place in nature, or for some styles of wedding - the Middle Ages, the Elves, the spring celebration, wedding a la Provence. Now fashionable wedding in shades of green, and green flowers in the hands of the bride - a symbol of hope, youth, fertility, mental harmony. 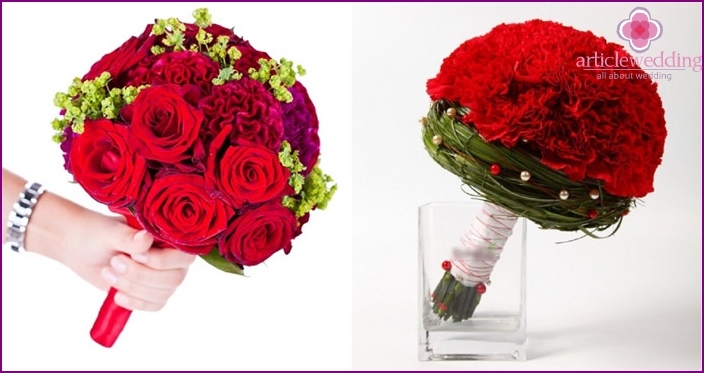 Diluting wedding floristic composition bright scarlet flowers, the bride wants to symbolically share with a partner their harmony, hoping for mutual love. Green flowers are not so easy to pick up, butflorists are green freesia, orchid, chrysanthemum or kaspedii. Color does not necessarily have to be an emerald, and olive allowed, and marsh, and the bottle. Bright green accents come to the fore and background colors become muted floral wedding extravaganza. The beauty and originality - that's the essence of flower variations.